Salt is naturally found in seawater and brine springs, but you can provide a supply of salt for your horse in various ways. All equine hard feeds and mixes contain some salt. But as salt can draw moisture from the atmosphere, which can cause feed to go mouldy, only small amounts of salt are added. It may be necessary to add extra loose salt mixed into the feed or to supply a pressed salt block or mineral salt lick. 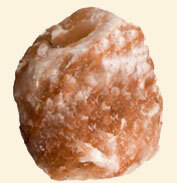 Himalayan crystal salt licks are becoming very popular. A mineralised salt block allows a horse owner to supply salt to horses that are kept at grass. When salt licks are provided in a stable they can be a toy to relieve boredom as well as an essential nutrient source. It is especially important ensure that you horse has plenty of fresh drinking water available if you are adding extra salt to his feed. WHEN SHOULD EXTRA SALT BE ADDED TO A HORSE OR PONY'S FEED? Salt was traditionally used as a purgative and as an appetite restorer. Today it is recognised that performance and competition horses require extra salt to compensate for the salt that is lost through sweating during exercise and training. Your horse or pony will sweat even in cold weather if he is being worked hard. If your horse is clipped out it may be difficult to see the sweat as it will quickly evaporate. A horse will regulate his own salt intake - if you provide a salt block or equine salt lick this should be adequate. Otherwise add 1 or 2 teaspoons of salt to his feed each day. Adding salt will help to prevent dehydration, restore lost electrolytes, and therefore help to prevent any loss of performance. You may want to use an equine electrolyte supplement instead of adding salt if your horse is working haard and sweating heavily. As well as a loss in performance a horse with a deficiency of salt may show symptoms such as licking, mud, wood and stones, chewing bark or eating soil.